A logframe matrix is a concise document that outlines the key features that lead to a project achieving its goal. A logframe consists of a 4 column by 4 or 5 row matrix. 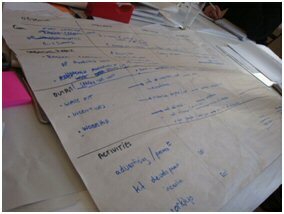 The first column represents the hierarchy of activities to outcomes that needs to occur for the project to succeed. The second column represent the indicators that are appropriate measures of whether the activities, outputs or outcomes have been achieved. The third column represents the data source, or means to verify the indicator. The last column is very important, and outlines the assumptions that need to hold true for that particular activity, output or outcome to occur. 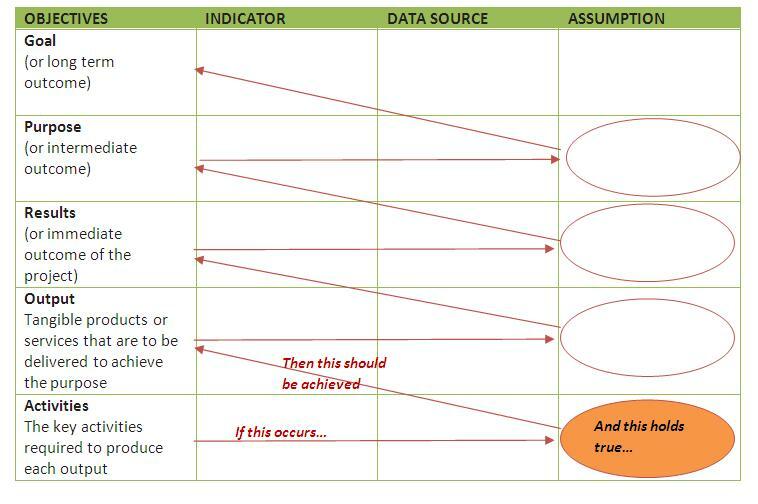 The assumptions column represents some of the complexity that projects need to consider. Examples of assumptions can be having the staff with the rights skills, the target group being actively engaged and involved, and whatever other internal and external factors are appropriate to your project. If assumptions do not hold true, they represent a risk, and a risk analysis should be undertaken. The assumptions column should be brainstormed by the participants who contributed to the problem/solution tree. The logframe matrix is used in project planning and is generally preceded by a stakeholder analysis and problem/solution tree, to form what is known as a Logframe Approach (LFA) to project planning. Where a solution tree has been developed, the lower branches would generally indicate the ‘activtities’ that need to take place , and the upper branches the outputs and results. The purpose would generally refer to the ‘core problem’ and the branches above the problem, or ‘ends’ would be slotted as the 'goal' in the matrix. The vertical logic connects (using the first and last columns) reflects the sequence of steps that lead to the outcomes being achieved. This is generally referred to as the means-end relationship. The vertical logic is read from the bottom up. The assumptions that are noted in each row have to be met for the hierarchy to be achieved. For example, by undertaking the activities, and assuming the assumptions are met, the outputs will be achieved. The horizontal logic consists of the individual rows, and represents a concise outline for monitoring and evaluating the project. You could consider using this as your monitoring and evaluation (M&E) plan, but it is recommended that you use the matrix as a foundation and expand it into a more comprehensive M&E plan.